Peter Tesar Architectural Design - Underfloor heating - wet or electric? Underfloor heating wet or electric? If you ’re choosing an underfloor heating system, you ’ll need to decide between wet and electric systems – and both have their advocates. One uses hot water as its way of providing heat while the other uses a heating element like that in an electric hob or immersion heater circuit. There are obvious pros and cons with each system. Every underfloor heating system will be unique, however, and it is best to consult with an expert to find out which system is best for you. Wet systems pump low-temperature water through a series of continuous pipe loops under the floor. 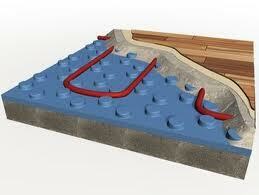 For a large area, a wet underfloor heating system will be more cost-effective. As well as providing an economical method of heating, wet systems can be used to cool rooms during hot weather in a much more energy efficient way than traditional air conditioning systems. The ultimate in ‘green ’ energy can be gained by using sustainable heat from borehole water or other geothermal technology – although this won ’t be viable for most British properties. The product cost along with the installation cost could well be cost prohibitive, however the long term running costs are minimal. Wet systems need to be totally embedded within the actual floor – which means existing floors will need to be dug up for the system to be installed. Electric systems can also be buried into your floor – but they also can be easily fitted underneath a floor covering, which make them more suitable for people who don ’t want the hassle of installing a full underfloor heating system. They also make more economic sense if you are only installing the system in one room. Repairs to electric underfloor heating systems are usually cheaper and easier compared to wet systems. Electric systems also spread the heat evenly across the floor. Because water cools as it passes through the system ’s pipes, wet systems tend to have uneven heat distribution, no matter how the pipes are arranged. The product cost along with the installation cost are very reasonable, however the long term running costs can be very expensive. Whichever system you choose, underfloor heating provides a sensible, environmentally friendly heat that frees up space from floors and walls that would otherwise house radiators – and can make your home warmer, more attractive and more comfortable.